The Conservatives’ problems with racism are well-documented – from National Front style posters in the 1960s, Hang Nelson Mandela placards in the 1990s and ‘Go Home’ vans three years ago which were even condemned by Nigel Farage. But Labour has not been immune; from the former immigration minister ejected from office in 2011 over an election campaign aimed at ‘getting the white vote angry’ (in the words of his campaign team), the 2004 posters reading ‘Labour is on your side, the Lib Dems are on the side of failed asylum seekers’, and Tony Blair’s comments on black crime after having presided over a sweeping escalation of stop and search. So it has been heartening to see some good come out of Labour’s antisemitism crisis over the last year; a road map to coherent guidelines on dealing with racism inside the party, provided by former Liberty director Shami Chakrabarti’s review. Chakrabarti’s report makes clear that “abusive references to any particular person or group based on actual or perceived physical characteristics and racial or religious tropes and stereotypes, should have no place in Labour party discourse,” and Jeremy Corbyn has adopted a MacPherson-style approach that introduces automatic suspension pending investigation over alleged racist incidents. Fitzpatrick’s defendants have tried to claim it is no different to saying the expenses scandal was the “worst of British politics.” But it is – if he wanted to make a point about politics in east London having negative elements, he could have said it was the “worst of east London politics.” He made a clear choice to racialise the mayoral selection issue (which incidentally, sees plenty of Bengali and non-Bengali Labour members on different sides of the argument). This trope is the same kind of dog-whistle politics used against Sadiq Khan by Zac Goldsmith in the London mayoral elections. 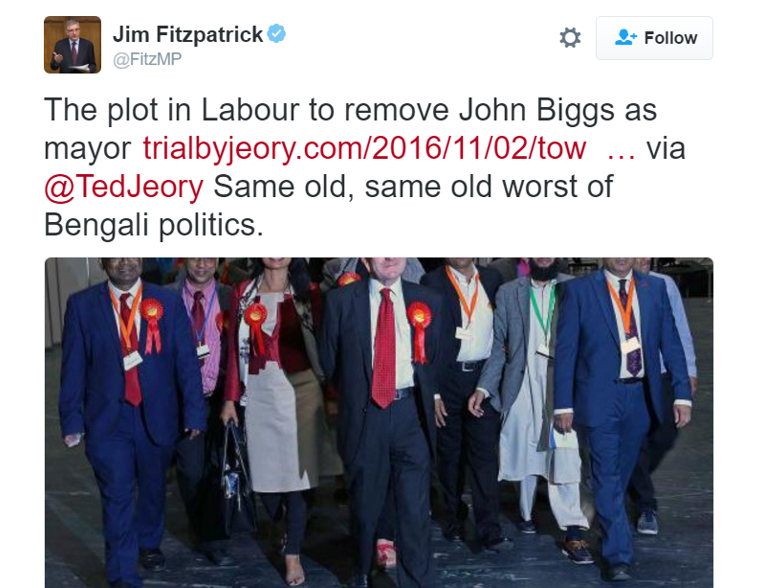 Suddenly a routine procedure – whether Tower Hamlets mayor John Biggs should face an all-member ballot before being Labour’s mayoral candidate in 2018 – becomes a dark, foreign plot. Just swap the word ‘Bengali’ for ‘Jewish’, ‘black’ or any other minority. It’s not the first time, either. In 2014 Fitzpatrick responded to an (ultimately false) claim of Isis flags flying in his constituency by asking where else in London Isis would “pitch up” other than Tower Hamlets. The far-right regularly uses the borough as a byword for Islamic extremism – it is no surprise many considered his rhetoric irresponsible. The local Labour party has been in ‘special measures’ for years. Labour has placed 14 constituency parties in special measures; 12 of which have dense ethnic minority populations. And just last week, a Bengali Labour councillor in Tower Hamlets was suspended from his group and party without notification of the incident he was being suspended over. There is speculation that the suspension was politically-motivated; but no proof of anything because the party has not seen fit to provide it. If Labour’s compliance team, so keen to suspend people during leadership elections, want to show they have taken Chakrabarti’s review on board, they should ensure that its principles are followed in all cases.